Do you have an account with Bank of India? How do you check the available balance in your account? Bank of India is one of the leading banks in India delivering excellent banking services and products across the country including several other countries. The bank gives high efforts to meet the growing requirements of the clients introducing several advanced services. Bank of India embraced the tech advancements to deliver exceptional banking services and ensure the convenience of the customers. Almost all account holders follow the traditional ways of making a balance inquiry. Passbook printing, using a Debit/ATM card and accessing online banking services are the traditional options. There are certain restrictions in accessing the traditional methods, and many account holders don't have easy access to those options. What if you want to know the available balance in the account at late night? 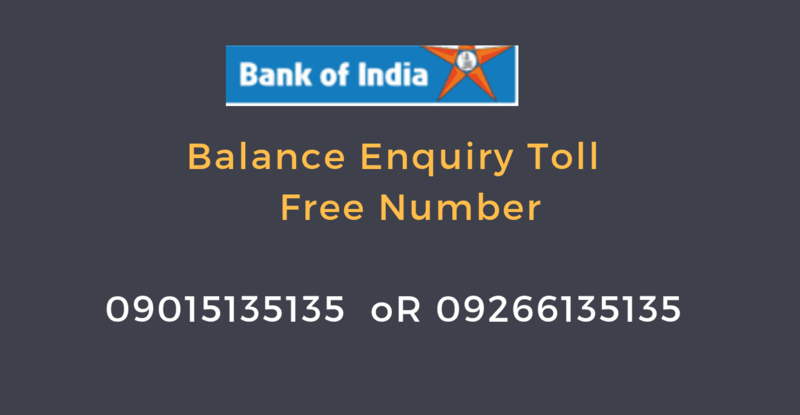 Bank of India provides a balance Enquiry Toll Free number for checking the available balance in the account! 09015135135/09266135135 are the Toll Free numbers to check balance in your account Dial the toll-free number from your registered mobile number. Give a missed call to the number or the call will get disconnected automatically after a few rings. You will receive the available balance info via SMS within a few minutes. You will get the balance info about the account linked with the registered mobile number. It is a toll free number, and you don't need to pay for the call. You can access the services round the clock and from any place. SMS should be sent from a mobile number linked with your bank account. Both balance enquiry numbers are working with all telephone operators. If you are facing any problems in getting account balance, leave a comment below. We will try to resolve your problem as soon as possible.